There are various types of Manchurian recipes are available. During jackfruit season one should also try jackfruit Manchurian. It is tasty and rich in fiber too! Jackfruit is one of the biggest fruit in the world. It is considered as a miracle fruit crop as it could save millions from starvation! It also has several health benefits. 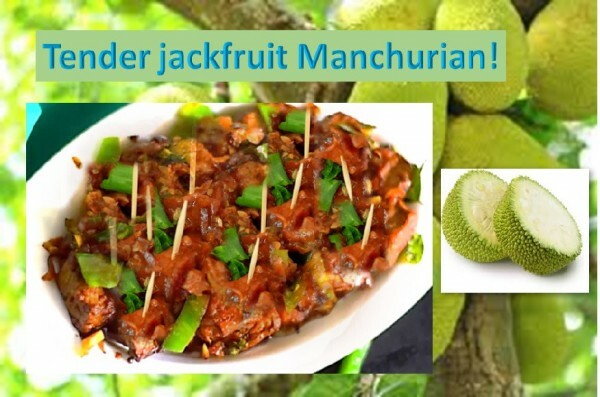 Before end of season, try Jackfruit Manchurian recipe and let us know what you think? Remove outer skin and cut inner edible part to few big pieces (3 or 4). Pressure cook cut jackfruit pieces without adding water on medium heat. After one whistle turn off the heat. Do not overcook jackfruit. Overcooking will not lead to good Manchurian. After cooling, cut jackfruit pieces to small 1 inch pieces. To these cut pieces add corn flour, all purpose flour, gram flour, red chilli powder, cumin powder, garlic and ginger paste and mix well by addling little water. Consistence should be like pakora batter. Transfer fried jackfruit pakora on paper towel to remove excess oil. In a vessel heat 2 Tbsp oil, add cumin, cut green chilli, garlic and ginger pieces. Sauté for a minute or two. Add chopped tomatoes, fry until tomato cooked, add onion and continue frying. To this above mix add tamarind – date mix and mix well. Add jackfruit pakora and lemon juice – mix well on low heat. Sprinkle chopped cilantro, scallion and salt. Mix and serve hot jackfruit Manchurian with green chutney and jeera rice !